The classic style of the Ascot Bar Stool Charcoal Fabric is perfect for creating a timeless look in the home. Fixed at kitchen worktop height, the elegant Ascot Bar Stool becomes the perfect addition to a luxurious bar area. The high backrest displays quilted button detailing, and chic charcoal fabric upholsters a belted seat pad for first-class comfort and support. Whilst the seat is edged with chrome studs for an ornate feel, the rear of the seat also boasts a decorative chrome ring. Supported on a solid wooden frame, complete with a smooth and stylish dark wenge finish, the four legs include a footrest and feet plugs to offer protection to flooring. "The look and quality is amazing I love them!" Cannot comment yet as waiting for kitchen to be finished!! Looking in the box,I am happy with purchase and excellent fast delivery. Bought 3 of these, previously a little pricey but tolerable, about to buy another quality is great comfy too. Can’t fault delivery, quick and efficient and well packaged. Nice to know some on line retailers know the meaning of good service. 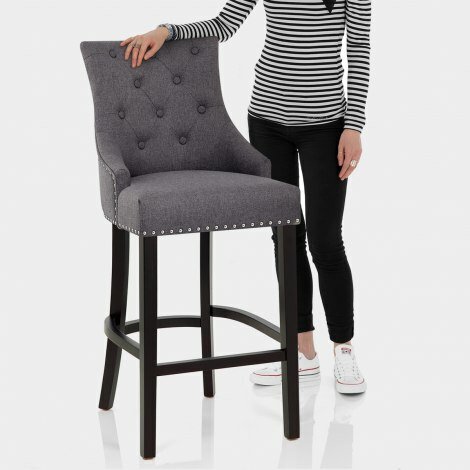 The bar stools are good value and the services is fantastic. Happy with the chairs they look fantastic and are very comfortable. The perfect hieght for kitchen island. Lovely fabric very pleased. Only problem was that one of the plastic foot cups was missing but I didn’t refer back as I was happy to accept it. Many thanks choosing to order from us and leaving a review. I'm sorry to hear that you are missing a protective plug - I will get customer services to call you to see if we can help you with it.